Michael talks to us about the importance of a placement and how he was offered a job at Red Bull prior to finishing his degree. I was privileged enough to have been offered a job as a junior structures analyst with Red Bull before I finished my degree, pending results. After working with the company for nine months I was then offered a promotion to the role of structures analyst. I knew that I wanted to work within motorsport, ideally in Formula One, before I applied to Plymouth and in that respect my career path has remained the same. However, the composites part of my degree helped me to realise that working with materials was something I wanted to do, leading to me becoming a structures analyst. Working in Formula One can sometimes mean working long hours to get the right parts out to the car in time for the next race, and naturally this can lead to a high pressured environment. However, I am consistently amazed by the way the factory pulls together to make things happen in half the time they should. This brings an amazing sense of achievement when, for example, you’re analysing a part on Monday and see it on the car at the track by the weekend. As part of my placement year I got the opportunity to go out to Spain for all three pre-season tests. It was great to see the car stripped and rebuilt each night ready for the next day’s testing. Also, it gave me the chance to see the parts that I’d worked on being used, developing a further understanding of how the car goes together. I sometimes consider whether or not I should have continued for another year and done a masters degree. However, with a job offer to go back to Red Bull, I think I made the right decision. I work with a variety of people from different backgrounds which makes it obvious to me that there is no one right way into Formula One. Prior to working for Red Bull I did lots of work experience for motorsport teams, in particular working on historic Formula One cars. I think this put me in a good position as I started at Red Bull with a good understanding of the processes and the ways in which racing cars work. Outside of the more traditional learning that I did at Plymouth, I learnt two skills that I use every day. The first is the ability to deal with other engineers and to work together to get to the right result for everyone. The second is, when faced with a problem, being able to go away and find the right information in books or from other people in order to solve the problem. The composite part of my degree gave me a really strong basis of understanding of composites. This meant that I was able to have a deeper understanding in composite projects earlier than I might have had otherwise. The group project work I did also gave me a good ability to manage timescales and hit deadlines when there are other people involved. My placement year helped me in my final year as it gave me direction as to what I wanted to do. It also showed me the real industry applications and methods being used that I could bring into my university work. 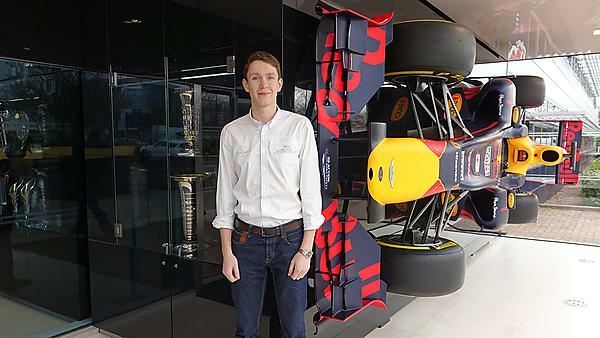 The other advantage of the placement year was that I was offered a job back at Red Bull after I had graduated. I would whole heartedly recommend a placement year to anyone. I have many happy memories of Plymouth, but I think my happiest memory is graduating on the Hoe. I was lucky enough to have a gorgeous day to finish my time there. I made some of my best friends at Plymouth University, who I still keep in touch with and meet up with when I can. I enjoyed my time at Plymouth and definitely would recommend it. It’s a great place to study with a balance between the University campus and the city centre, with good facilities and industry links.